Mount Butler (Heritage) race is one of the oldest cross country running race in Hong Kong. 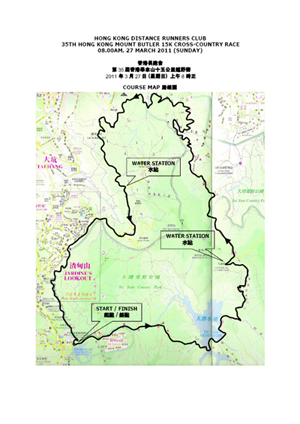 The course is a demanding 15km cross-country race which takes runners through the most scenic Tai Tam Country Park. It starts at the Urban Council Carpark on Tai Tam Reservoir Road. The runners exit the Carpark and run up Tai Tam Reservoir Road, pass Parkview Apartments. Then proceed downhill, cross the reservoir, and turn left along the trail, run uphill to Mount Parker Road. Downhill and turn left onto Sir Cecil's Ride heading to Mount Butler. The runners exit Mount Butler continue run on the road, and turn left to another section of Sir Cecil's Ride and follow the trail to finish at the Carpark. 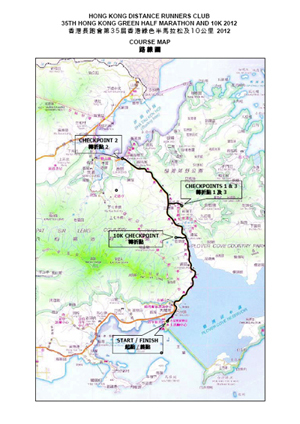 The Green Half Marathon and 10K Race is a demanding out-and-back road course around the scenic Plover Cove Reservoir. The course starts at the Youth Hostel at Tai Mei Tuk near Plover Cove Dam, proceed along Brides Pool Road to Wu Kau Tang then to Luk Keng, and turn around. Return along Brides Pool Road with a loop out to Wu Kau Tang, the second turn around then continued along Brides Pool Road back to finish at Youth Hostel. The whole distance makes 21.1 km, exactly half the distance of a standard marathon. The race will be conducted under IAAF rules.